Under the Christmas tree, some of us will hopefully find a great Iphone 4 32G, an amazing 9.7 inch Ipad 3G, a Dell netbook, a Sony PSP® or a Nokia N8 smartphone. On the user manual, it shall be written how to handle it but certainly not how it has been made. Today, La Vie French magazine publishes a long story (including side boxes here and here) about life at Foxconn, main Apple’s supplier. Sorry, it’s only in French but let me propose you my comment in English. 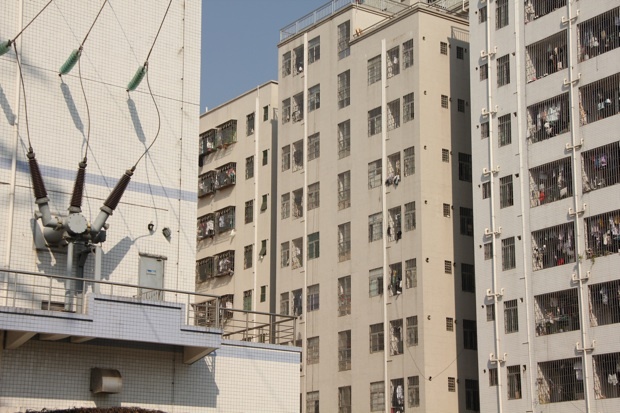 Despite tragic suicides (14 officially – one last November, yet much lower than in others fims like France Telecom but when it comes to very young people in such a guarded area, it raises questions) and several promises for pay rises, Foxconn is still compared by Hong-kong ngo Sacom, as a “labour camp”. How come? So I went there in May and then back again lately, to check what really changed during this 6 months period of time. Salary is now high, better than any other factory around, but happiness is still not here, whatever swimming pool or tennis court you might have seen on tv, owing to Foxconn p.r. Is it due to Foxconn’s military discipline (typically taiwanese, i have been told) ? to a rather hostile environnement (huge dorms, huge factory) that doesn’t match with young workers expectations? 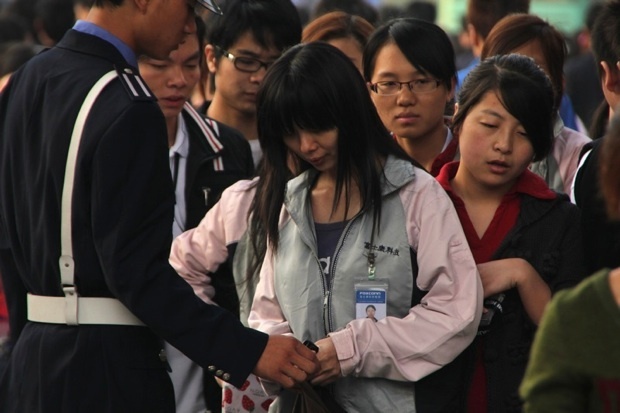 Everyday, Xiao Li, 18 years old, wakes up at 6 in the morning in a room where she has be assigned by her manager, with 9 other people, coming from 9 different places. On 6h40, she leaves her room, walks down a long road and arrives at the South gate after a 20 minutes walk. She will buy noodles on her way, like every morning. If she eats at the canteen, she will waste time and sleep less. In this giant factory outside Shenzhen, Xiao Li and his 300 000 comrades get ready for a 13 hours a working day (excluding lunch break, including overtime), six days a week with a 10 minutes break every two hours. Six days a week is normal in China but it can easily turn to 7 days when sudden customers’ orders come up. At her production assembly line, which has always been relying on human labour more than sophisticated machines for cost reasons, she is not allowed to speak, listen to music or even look at her comrades while trying to achieve the christmas production targets. Her mobile is confiscated every morning too but insults from managers, she says, have disappeared. Instead, they just ignore her, after all the bad publicity they got last spring when 13 Foxconn suicides hit the headlines which blamed the company for harsh management. However, a noticeable improvement has been made after 30 glorious years of economic reforms in China: she is allowed to sit down while working. Well, it depends on her manager’s good mood. Compared to the toxic bluejeans factories in Xintang or swimwear factory in Dongyuan, what is striking here - although it is NOT child labour - is that all of the workers are 17, 18, 19 or in their early twenties. Foxconn doesn’t want older people to live in this 320 000 people city. 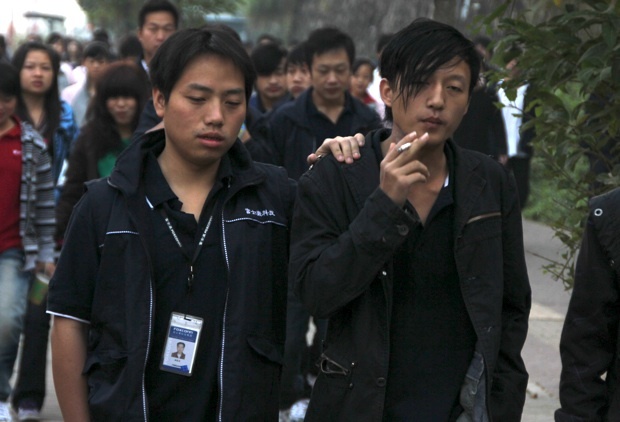 The young foxconn workers are obedient, have almost no previous work experience and they don’t have a clue about what labor rights mean, according to Liu Kaiming, director of the Institute of Contemporary Observation, a labour right group in Shenzhen. 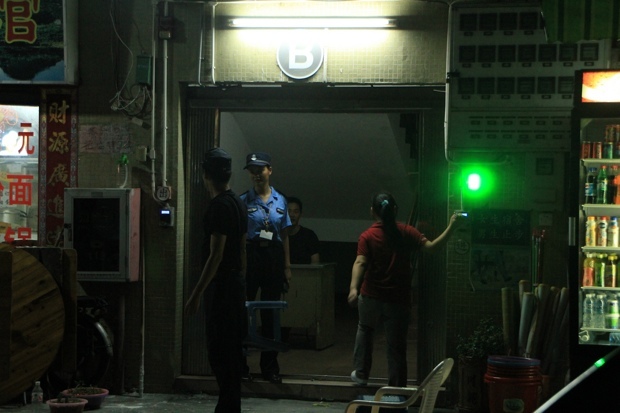 They would never complain, in such an unfriendly environnement where security guards, like those bloodcurling fluorescent lamps, are everywhere: at the dorms, at the canteen, at the recruitement center or at the workshop. Inside the factory, if you call the police number , you will have great chance to be transfered automatically to the guards phone number. As far as me and my cantonese interpreter were concerned, guards illegaly tried to check my passeport, her id card and even called the police when we asked them politely to call the Media department for us. For sure, Foxconn likes secrecy. 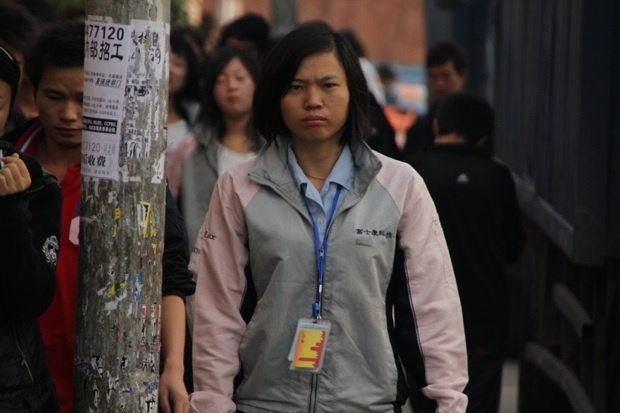 These young workers are educated, are often the fruit of China’single child policy. They have moved from small towns in remote parts of China after their degree. 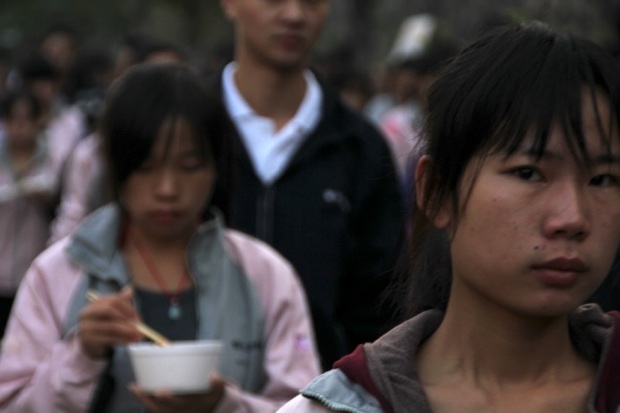 They are the new generation of Mingong (=migrant workers) in China. Their parents are farmers or migrant workers themselves, from poverty-stricken provinces like Henan, Hunan, Sichuan. But these families hope their children will send them back some precious money, to build a concrete home or to cover health expenses. However, none of these parents have any idea about how difficult is their child’s job, how harsh is the military discipline, how hard is it to socialize when you have no time for it and how big is the pressure provoked by higher productivity objectives. Like many African migrants in my country, Foxconn kids only want their parents to believe they are successful. And the only thing that matters for these children is their salary, not even themselves. Bigger pressure? As westerners say: no pain, no gain. During a 3 months trial period and owing to Taiwanese consultants, Foxconn workers’ productivity has been gradually risen. This little 17 years old girl with a red heart (see below) checks the quality of the expansive HP ink cartridges… 28 0000 a day (! ), 40% more than last Summer. While working, she doesn’t have to think nor to open her eyes, she just has to breathe and let her fingers feel the cartridges as fast as possible. Every single minute is now scientifically maximised. Because she has been trained for that and she has now much more value than any sophisticated machine in the eyes of Foxconn, she won’t be able to change position during her stay here. She will be doing the same movement for the next three years, 3 years being the average lenght for any worker in Foxconn, before they get worn out. We also met Ling Hui Ping on the way to the factory. He told us he was on the Iphone assembly line. He is coming from Hunan, his parents are crop farmers. At 20h30, after listening politely to his managers comments and criticisms, after cleaning his workshop perimeter, it’s time for this 18 years old boy to rush to his dorm, alone. Because Foxconn city is so big, it can easily take half an hour to get back home. At 21h30, he will only enjoy one hour to empty his head and get a life: calling his family, taking a shower before his dorm lights are turned off. 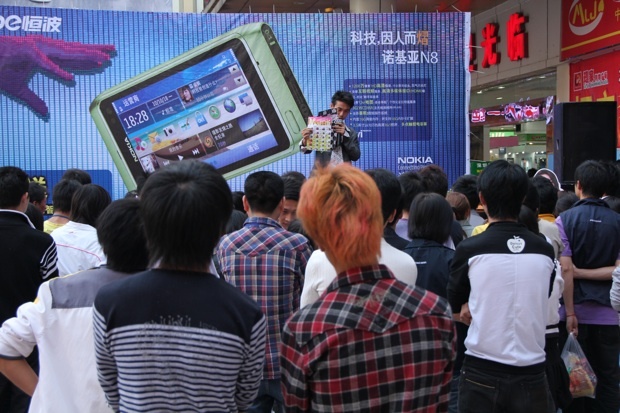 Outside, famous brands like “Lining”, “Baleno”, “Nokia” have been inaugurating there shops for a few weeks and been playing electronic music like hell, in an attempt to attract workers and get the most out of their new purchasing power. Mc Donald is said to arrive soon. Tonight, our friend may be able to sleep, or not. He has one dream: to collect enough money and start a small business, in his home town. “Probably, a phone shop“. On Internet, young Chinese people in the cities enjoy making fun of these mingong life style: they love flashy clothes, fluffy hairstyle, cheesy pop songs, romantic films. On their day off, they are fresh, smiling and positive. At first sight, you would never guess what they endure. Foxconn kids have been assigned to packed dorms with people from different shifts, differents workshops, different hometowns, giving them rare occasions to know each other. However, a friend at China Labour Bulletin recently told me that owing to the pay rise, it was actually the first time he could see a smile on Foxconn’s workers face during their day off. He is right. Once a week, on their day off, owing to their bigger salary, workers are able to treat themselves and enjoy simple pleasures like a funny haircut or a good candy. They like showing up on the bridge upon Foxconn main gate which now looks like a catwalk. Some workers get spiritual and spend their only day off praying together, with the risk of being evangelized by some foolish priest . Some are left alone. But lots of them were willing to talk to us and describe their everyday life… some would mention face-losing punishments : when something is missing on the assembly line, one has to stand up during 6 hours, nose to the wall. All right. Terry Gou, Foxconn CEO and Taiwanese billionaire, has delivered on his promise to increase salary at Longhua: workers now get 3200 yuans per month, including overtime. It’s a very good salary indeed, even better than the salary of graduate people in many cities. The strikes at Honda Foshan and the pressure from Shenzhen and Guangdong governements to prevent any threat to their sacred “Harmonious society” did help. But one have to take into account the sharp rise of food prices in China: +11.7% in November, +10.9% in October. Fragile Foxcoon workers are supposed to be offered psychological support through a hotline phone number. 1/ the calls are not anonymous at all as you must give your name and the number of your workshop BEFORE telling about your problem. 2/Franz Kafka may laugh as these psychologists are simply other workmates who have been offered this unusual position overnight after a quick book training. This leads to unsolvable situations. One worker that we met in a shop said “2 months ago, I mentionned a difficulty to the hotline. The week after, my manager knew about it and said it was no longer his responsibility any more since i had decided to deal with that with the assistants. He has lost his trust in me“. On the otherside, a new recruitement center has been built to hire workers for the new factories in Henan or Sichuan where salaries and production costs will be lower. If Foxconn doesn’t change its practices, local governements might eventually do something. 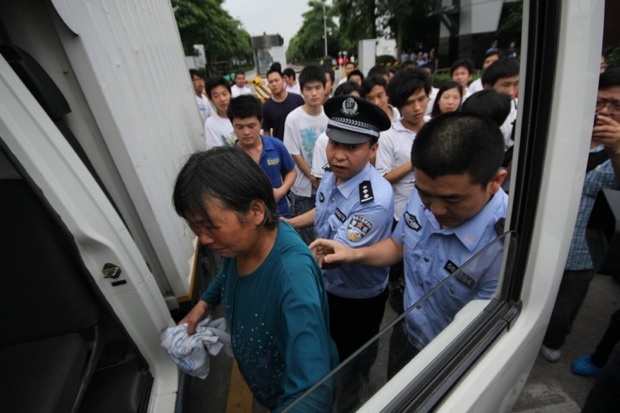 Chengdu, which is going to welcome hundred thousands of workers for Foxconn new plant has promised it will reduce hukou disparities between migrants workers and local urban people, given them and their relatives a access to education and health care. 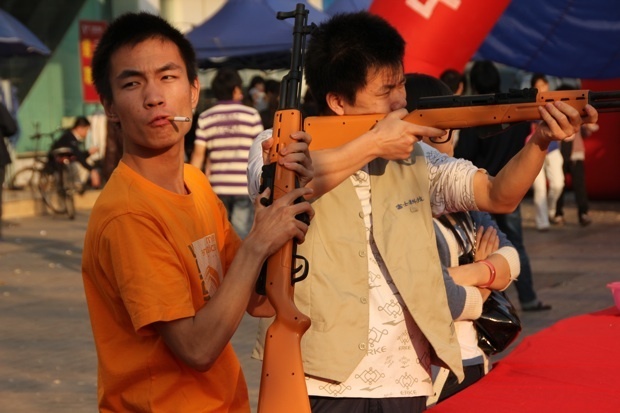 And in case any social protest happens, Foxconn will be able to rely on People’s Liberation Army’s support. 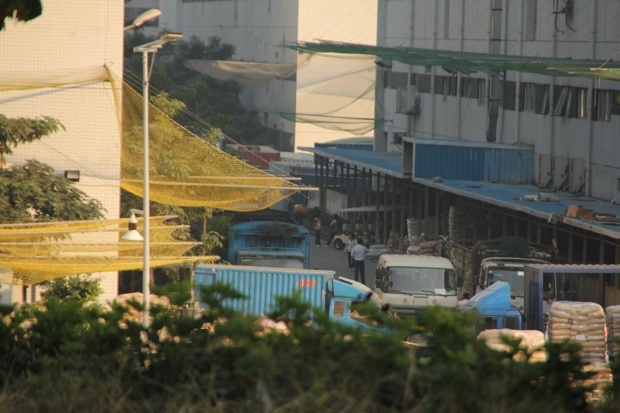 The folks are setting up a small artillery regiment… just two blocks away from Longhua factory’s main gate. Merry Christmas ! Some of you will think that it’s always better to have a job than nothing, that these young people will be helpful for their whole family, that it’s worse in Bengladesh, Philippines or in some western suburbs. It’s a blog, it’s my opinion and i am seeing this from a different perspective. If i want to focus on Apple, it’s not for my glory but because i am using this brand which i appreciate very much, like more and more Chinese people here (I live in Beijing but i am always stunned to see the long queues at the Sanlitun village Apple store at 10 am, where a Iphone easily costs a 1 month salary). Apple’s prices are very high (and similar whether you’re Chinese or American), its products are all the same whatever the market and yet, this successful and trendy brand fails to have a global staff strategy. But when it comes to cost cutting, Apple doesn’t mind offering third world treatments. 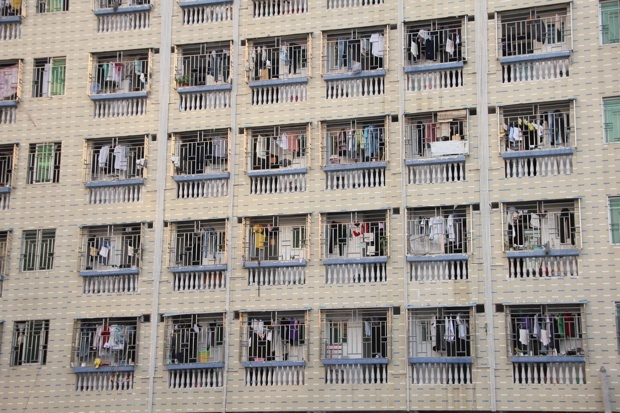 (Iron bars on windows are part of Chinese cheap modern architecture to prevent theft. What is new since i first came last May are the extra steel wire (below), the nets and the fences on the roofs). On day off, outside the dorms, Foxconn seems so far away. Brands are now trying to attract Foxconn workers in front of their dormitories, after the 67% pay rises. In May, such events did not exist. These mingong make these phones too… but they won’t get a discount. 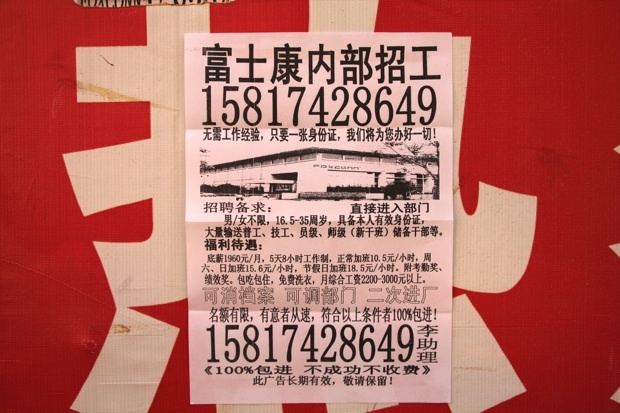 Here is a fake Foxconn job offer that proposes only 5 working days, no unpaid overtime and bigger basic salary. When we call them they ask for a 500 rmb commission fee … only to bring you at the Foxconn job center. Below: an unregistered home church on the first floor of a gloomy dormitory. 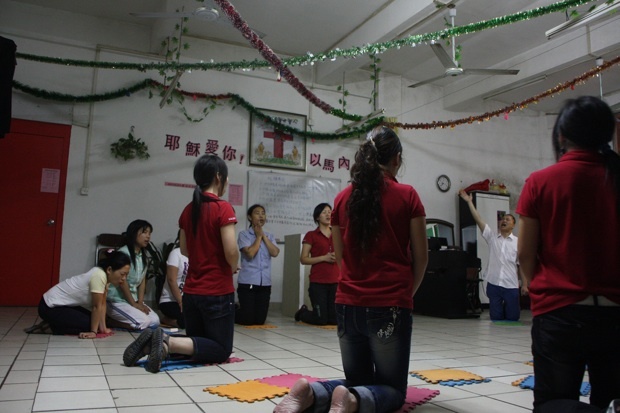 The priest is Taiwanese and is traveling from one factory to another to “evangelize” people. In China, religious activities are under the control of the Chinese governement, obviously not here. Friends, these pictures are copyright. Please email me first in case you are interested in using/buying them. * the original title of my blog post was “Why I don’t want a Iphone for christmas” but i decided to change it on December 26th after receiving dozens of insults from Apple addicts. However, it is a personnal blog post, where i am free to express my opinion. I still believe Foxconn is definitely not a nice place for a Chinese educated teenagers to live and work. I have been working in China for 2 years and a half. Like ALL correspondents, I like traveling with an interpreter. No only when it comes to use cantonese or a dialect but because this person will help to establish friendship and confidence between me and the worker who has probably never met a “laowai” (= foreigner) before. This entry was posted in reportage, societe and tagged acer, apple, china, china labour bulletin, chine, foxconn, germinal, hp, longhua, mingong, nokia, ouvriers, psp, sacom, shenzhen, smartphone, sony, workers. Bookmark the permalink. Lots of the people that i interviewed would go back to the countryside, to their small town and start their own small business… no more “laoban” as they say. Others, especially girls, would pay themselves a training on computers to find a small office job. I also met workers who gave up foxconn to work in the shops/restaurants/massage salons around the plant, for the managers and local party officials. I worked for Disney Cruise Line. The “policy” was not allowing the workers to work more than 14 hs a day. And they gave you a sanction if you did…. That did not prevent that 95% of the workers chose to work 13.5 hours a day. What was work like? Wake up 6 am in a 6′ by 6′ room with no window and 3 other people from different parts of the world, walk 800 feet in a dimly lit corridor to the cafeteria. Eat disastrous food. And 10 minutes later start a 14 hour long dish washing day with 2 30 minutes break and 2 10 minutes break, enduring a steamy 100 deg ambient. All this, every day for at least 6 months with NO DAYS OFF for $1000 a month. This is happening right there in the US right now 2010 and in more than 1000 other cruise ships everywhere in the world. And people choose to do it, even americans. Why? Who knows… I did it for the money… You can go to Florida, Merrit island cruise dock and ask any of the employees of the 4 other cruise ships that dock there why they do it. You don’t need to go to china to look for very bad work conditions. Thanks for sharing your experience about modern slavery in the country of Mickey Mouse. Of course you will always find smart people who will tell you “you’re free to leave and find another job” but it’s not that easy. I think i have visited at least one hundred factories in China (from shopsticks makers on the russian border to m&s bras in guangdong) and of course you will always find worse but does Sony Ericsson impose any SA 8000 norm ? How can they make sure their online social code responsability is not only something to bring good conscience to their customers or even their headquarters employees? In La Vie print edition this week, I mention the interesting work of a French “cabinet d’audit social”: they know it’s impossible not to avoid overtime and false labor contracts but they propose a different approach toward chinese suppliers and their workers, so that the chinese factories don’t have to fake the quality audits too much nor give bribes to the inspectors. We can carry on the discussion by email if you’re willing to. Which billionnaire industry in France hire 300 000 workers in these conditions? Thank you for an intesting insight to Chinese sweat-shop-slavery. I used to work for cell phone industry for many years, and experieneced the manufacturing move to China form Europe, US, Mexico etc. The labour in China is much cheaper, and you can realize why when you see the working methods and conditions in China. However, another aspect I’d like to get attention to: environmental aspect. For instance most cell phones are painted or electro-chemically coated, and there is over a Billion cell phones manufactured annually! Now in other regions of the world the painting and coating lines need to comply the high environmental standards of separating and recycling the waste and toxic chemicals. In China the sludge is dumbed into the drainage waters or soil (realized it happening in several factories). When in other countries the painting and coating lines are built according the environmental standards, the investments are much higher that in China, and operating costs many time higher. And the cell phone cover that is painted environment-friendly becomes too expensive! The customers, i.e. those big brand names (pretending in their marketing to be the environment friendly companies) that are fully aware of the fact, just state that they “need to follow the local legistlation only”. I think that its is double-talk in its very meaning. You single out Apple, then suggest HP passes on the low costs. You forget the HUGE margins they receive on printer cartridges for Inkjet, and laser cartriidges. I don’t see HP passing along savings on these items, which are a major profit center for them. Amazing you don’t bring that up when discussing HP. Everybody has started talking off Foxconn and it’s inhuman working hours. Let me share my experience as a doctor in India, when I started the career as a resident. My shift started at 8 AM, caring for the patients in ICU and wards, continued the whole day , whole night and ended the next day at 6 PM, yes full 34 hrs at a stretch. The same cycle of 34 hrs non stop work, would start after the night’s sleep. This was the pattern thru out the Indian medical colleges, and exists even today. Sometimes I wonder, the strict time limits followed by the airlines for pilots and crew, on the premise that that it involves, passenger ( Human Life) safety, but what about us, the doctors, who have to take life/death decisions. I am sad that you have to work so hard. It makes me think that your patients are taking a risk as well, if you are too exhausted to treat/cure them properly. Remember you have been offered a dream job, it’s your passion and you have a status, consideration and respect from your community. It’s such a different world. 1. The workers took the job at their will. They were not forced into taking the job, and they needed the money. 2. Social responsibility is not Steve Jobs’ business. Nor is it any business’ business. Steve is a CEO of a publicly traded company, which means his only responsibility at Apple is to make sure the earnings of Apple beats investor’s expectation. If he is not doing just that, he is not doing his job. Good Business = makes the most profit without breaking the law, Government = everything else. 3. Stop pointing fingers at coorporations/businesses, the problem is with Chinese gov’s policy. If the government (supposly representing the people) don’t gives a rat crap about human rights, maybe this is what the people wanted. Unless, of course…. it isn’t a democracy. I think the article is exagerated. just because they don’t have a democratic system or they are christians it doesn’t mean anything. Most of the imports come from China. I don’t know what would happen if China disappears, perhaps our youths will then have to work?. So we should be grateful to the chinese for you having our iPhone for 300 usd an not paying thousands in case it was manufactured in the west?. In Florida there are thousands of illegals working in similar or worst conditions and who cares?. This is not happening only in china is all over the place. Thanks for the interesting story and pictures. The Chinese government and authorities need to treat their own citizens with dignity and respect for human life, not exploit them. I agree with almost everything you say, but would argue that corporate social responsibility initiatives will not solve much. What needs to change is Chinese labour law, health & safety regulations and the law on trade union liberty. In my view, CSR is often used to enhance a company’s image rather than to really make a change. Building a beautiful swimming pool for Foxconn’s workers does not make their 6-day, 13-hour repetitive working week any easier. Thanks for this insightful article and keep up the good work! The problem causing suicides in China and France, France Telecom, is not the working conditions. It’s a little known phenomenon discovered when it caused mental breaks for office workers. The cubicle was designed to deal with the vision startle reflex to stop the problem in offices by 1968. Foxconn uses cubicles in their office situations but did not realize that assembly line workers have the same behaviors to cause Subliminal Distraction exposure. All the suicides have been assembly line factory workers. There have been ho janitors, or grounds keepers. If you take pictures of the assembly line workers they are too close together without Cubicle Level Protection. The entire cubicle is not needed. But there should be some peripheral vision blocking scheme between concentrating workers. Agree with most of the blog, but the steel wires are a fail. 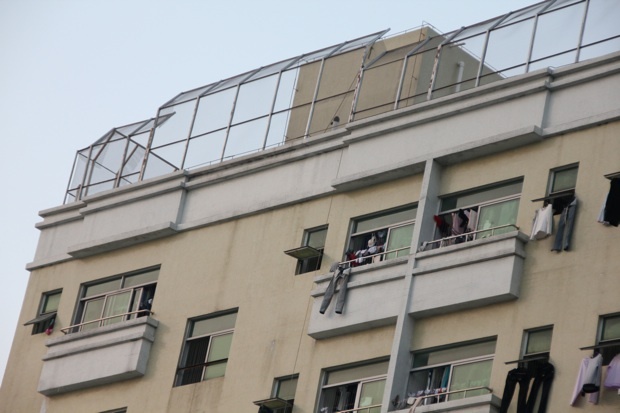 My apartment in Guangdong (as opposed to the one i Beijing) also has the steel wires. I had them installed a few years ago. They are not to keep thiefs out, they are too weak for that. They are to keep the laundry in. Especially when a tyfoon hits. Nothing dark about these wires. The steel wires have been officially installed last summer to prevent suicides. Those with bars already don’t need them. Anyway, if it’s not dark it’s prison style. Remember these kids come from the countryside or small towns. I am not saying it’s wrong but it’s an hostile environnement for a teen. They need more consideration than other generations. Thank you for warning people about these awful working conditions in China. This is a tragedy for humanity and The future of these teens generations and consequently our Future. Our Responsibility is spiritually huge whatever think those people who smoothly criticize your point of view to protect their way of life; They had rather point on the guilt of companies and governments than acknowledge their own part of responsibility as a “Human being”. Companies and governments are gathering of Individuals, How to disociate my responsability ? Thank you for takeing the time to translate everything. Actually I’m French so I didn’t need it but the way you explain everything is very interesting. I’m currently working on a project in France and I want to know if I could expose your work? The project will take place at a business school in Montpellier during the sustainable week (begining april) and we will work and show the mobile life cycle and all the social, enviromental and economical consequences linked to the mobile phone. I would like to show your report and your picture sand as well I would love ot have more information from the person number 6 who reacted the one called “no name pls”…. who wrote about the environmental consequences of producing a mobile phone in China (December 27th). Could you put me in touch with him or her? Thank you for your help, you can email me for further conversation if you like. Right now my father in hospital so please happl me . Hi Jordan. I’m brazilian. I live in state of Sao Paulo. some years ago, i’m became interested in everything that expose or talk about the injustice in our world. So I started to read, watch and hear about the holocaust (i read books like IBM and holocaust), soviet history, some books written by jeremy rifkin (like the End of Work)and another titles. I’m interested in view your video about the terrible conditions of workers in Foxxconn Industry in China. This corporation is coming to Brazil, where the conditions are similary.. Your video in YouTube is classified like private, so I would like to know how i can watch it and how can I coorporate with you. Thank you for sharing about crazy foxconn factory experience. I have been shocked by this news about worker who committed suicide. 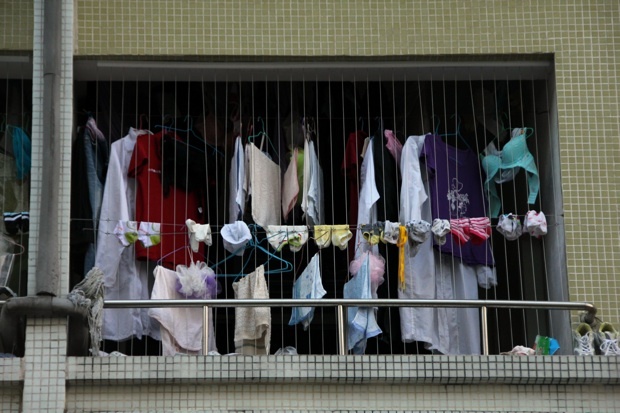 Many of my neighbors are preparing to go to China as a migrant workers. I will share what you are mention in you blog. I agree with you and feeling with you. Share more about this kind of news for me.